Appropriate resolution of inflammation is known to be essential in tissue homeostasis. In this study, we evaluated the significance of a macrophage-derived soluble protein, apoptosis inhibitor of macrophage (AIM), in LPS-induced lung injury in mice. After oropharyngeal administration of LPS, the level of free-form serum AIM increased on days 2–4, accompanied by the resolution of inflammation, which was observed in the cellular profile of bronchoalveolar lavage fluid. In an experiment using wild-type (WT) and AIM−/− mice, the resolution of inflammation was accelerated in AIM−/− mice when compared with the WT mice, which was reversed when recombinant AIM protein was administered. The changes in the histopathological findings and inflammatory mediators followed similar trends, and the ratio of apoptotic cells was increased in AIM−/− mice when compared with the WT mice. In vitro analysis showed that macrophage phagocytosis of apoptotic neutrophils was suppressed in the presence of AIM, indicating that anti-resolution property of AIM involves efferocytosis inhibition. In lipidomic analysis of lung tissues, the levels of several lipid mediators increased markedly when LPS was given to WT mice. However, in AIM−/− mice, the concentrations of these lipid mediators were not significantly upregulated by LPS. These data reflect the significant role of AIM in lipid metabolism; it may suppress lipid metabolites at baseline, and then produce an inflammatory/pathologic pattern in the event of LPS-induced lung injury. Taken together, AIM may play an orchestrating role in the resolution process of inflammation by altering the profile of pulmonary lipid mediators in mice. Acute lung injury (ALI) and its clinical entity, acute respiratory distress syndrome (ARDS), are major causes of acute respiratory failure with high lethality, and they are associated with several critical conditions, including sepsis, multiple organ failure, and trauma (1). ALI/ARDS is a significant burden for the public health system, and it has been estimated that 190,000 patients are annually affected in the United States, resulting in 75,000 deaths per year (2). ALI/ARDS is characterized by accumulating neutrophils that produce proteolytic enzymes and trigger tissue injury, which leads to the disruption of barriers between alveolar space and blood vessels, impairment of alveolar fluid clearance, and protein-rich alveolar edema (3, 4). Therefore, after the inflammatory triggers have been removed, neutrophil recruitment should be promptly terminated, and unnecessary and excess neutrophils should be removed (5, 6). The resolution of the inflammatory process is thought to be active, not passive (7), and several molecules, mainly lipid metabolites, such as resolvin (8, 9), protectin (10), lipoxin (11), and maresin (12–14), have been found to play roles as specialized proresolving mediators (SPMs) (15). Some of them have the function of limiting neutrophil recruitment (16) or promoting the lymphatic drainage of leukocytes (17, 18) or the uptake and clearance of apoptotic cells in inflamed sites (19). However, the mechanisms that orchestrate these mediators and regulate the resolution of inflammation have not yet been fully elucidated. Note that the amplitude and duration of inflammatory status should be fine-tuned according to the extent required for homeostasis and integrity of a living organism. Inflammatory reactions should be induced when protection against pathogens is necessary, but they should be suspended as soon as the harmful stimuli are removed. For maintaining this balance, the monitoring of inflammatory stimuli and adequate responses to them are critical. Therefore, understanding the molecular and physiological pathways that monitor and control the inflammatory process is crucially important. To address this, we focused on a molecule, apoptosis inhibitor of macrophage (AIM), which is also known as CD5 molecule-like and has been reported to be involved in responses to microorganisms, inflammation, and lipid metabolism. AIM is a multifaceted IgM-binding protein (20), which is expressed exclusively by macrophages (21). AIM has binding activity to LPSs and lipoteichoic acid, and it is thought to potentially act as a pattern recognition molecule (22). Additionally, AIM is reported to have an apoptosis inhibitory function for macrophages, T cells, and NKT cells and to counter proapoptotic stimuli, such as FasL, radiation, and glucocorticoid administration in these cells (21, 23–25). AIM has also been thought to be proinflammatory in the pathogenesis of atherosclerosis (26), bacterial infections (24), an inflammatory bowel disease model (27), and chronic obstructive pulmonary disease (28). Moreover, there have been several reports showing the association of AIM with biological lipids, including in fatty acid synthesis (29), the subcellular membrane (30, 31), and extracellular vesicles (32). Based on these data, we hypothesized that AIM may play a role in the check-and-control mechanism in the setting of acute inflammation. In this study, we evaluated the effects of AIM on the resolution of ALI using a murine model. We investigated the dynamics of blood AIM levels in response to LPS as well as alterations in the severity of inflammation in AIM-deficient mice. We also assessed the effect of AIM on apoptosis of inflammatory cells and phagocytic removal of these cells by macrophages. Moreover, we analyzed the lipid mediator profile in lung tissue to show the link between AIM and these crucial elements in ALI/ARDS. Male C57BL/6 (wild-type [WT]) mice were purchased from Japan CLEA (Tokyo, Japan). AIM−/− mice had been created as described previously (21). All mice were maintained under specific pathogen-free conditions under a 12:12 light-dark cycle with food and water ad libitum. Male mice at the age of 8–12 wk were used for experiments. All experimental protocols and procedures were approved by the Ethics Committee on Animal Research of the Hokkaido University School of Medicine. Using a micropipette, physiological saline alone or 4 mg/kg LPS (O111:B4; Sigma-Aldrich, St. Louis, MO) diluted in physiological saline was instilled into the oropharyngeal space of mice under ketamine/xylazine anesthesia. For the measurement of AIM in the serum, we collected blood every 24 h for 7 d after oropharyngeal LPS administration. Mouse serum was stored at −80°C until analysis. Serum was 10× diluted with distilled deionized water. Then, for native SDS-PAGE, the diluted serum was mixed with 2× sample buffer without reducing reagent and applied to SDS-PAGE. For reducing SDS-PAGE, the diluted serum was mixed with 2× sample buffer with 10% 2-ME and boiled for 5 min before being applied to SDS-PAGE. After electrophoresis, the proteins were transferred to a polyvinylidene difluoride membrane and incubated with polyclonal rabbit anti-AIM Ab (rab2) in skim milk at 4°C overnight. Then, the membrane was incubated with polyclonal goat anti-rabbit Igs-HRP (Dako, Glostrup, Denmark) in skim milk at room temperature for 1 h. After the Ab incubations, the membrane was incubated in Immobilon Western HRP ubstrate (Millipore, Billerica, MA). Luminescence was detected with an ImageQuant LAS 4000 Mini image analyzer (GE Healthcare Life Sciences, Pittsburgh, PA). The serum AIM concentration was assessed by semiquantification of the band intensity on the immunoblot using ImageJ software (version 1.48v; National Institutes of Health, Bethesda, MD). Mice were euthanized by CO2 narcosis at 1, 3, 5, and 7 d after LPS administration. The bronchoalveolar lavage (BAL) fluid was retrieved by injecting 0.6 ml of saline through a tracheal cannula three times, as described previously (33). Total cell counts in the BAL fluid were determined with a hemocytometer after treatment with RBC lysing buffer (Sigma-Aldrich). The cell differentials in the BAL fluid were determined using cytocentrifuge preparations stained with Diff-Quik (Sysmex, Kobe, Japan) and by examining >400 cells under a ×1000 microscope. After BAL fluid was retrieved, the lungs were inflated with diluted Tissue-Tek O.C.T. Compound [50% v/v in PBS(−) and containing 5% w/v sucrose; Sakura Finetek, Tokyo, Japan], removed from the thoracic cavity, and immediately frozen on dry ice. The specimen was stored at −80°C until evaluation. Sections of the lungs (5 μm in thickness) were stained with H&E. The degree of lung injury was assessed in >15 randomly selected fields in each section at ×100 magnification based on a semiquantitative scoring system by D’Alessio et al. (34) with some modifications (Table I). The concentration of total protein in the BAL fluid was determined with a Micro BCA protein assay kit (Thermo Fisher Scientific, Rockford, IL). The concentrations of TNF-α, CXCL1/KC, and CCL2/MCP-1 in the BAL fluid were determined by ELISA kits (R&D Systems, Minneapolis, MN) according to the manufacturer’s protocol. Total RNA was extracted from lung tissue with an RNeasy Mini kit (Qiagen, Hilden, Germany). The RNA was reverse transcribed with TaqMan reverse transcription reagents and reverse transcription reaction mix (Thermo Fisher Scientific) on an ABI 2720 thermal cycler (Thermo Fisher Scientific). The resulting cDNA was used as a template for real-time PCR on an ABI Prism 7300 sequence detection system (Thermo Fisher Scientific). TaqMan gene expression assay probes (Thermo Fisher Scientific) were used for mouse β2-microglobulin (Mm00437764_m1), TNF-α (Mm00443258_m1), CXCL1/KC (Mm00433859_m1), CCL2/MCP-1 (Mm00441242_m1), and CD5 molecule-like/AIM (Mm00437566_g1). The β2-microglobulin was used as the internal control. Apoptosis in BAL cells was determined by flow cytometry using an annexin V–FITC apoptosis kit (BioVision, Milpitas, CA) according to the manufacturer’s instructions. Briefly, after the supernatant was removed, the BAL cells were treated with RBC lysing buffer (Sigma-Aldrich) and were washed with PBS(−). The cells were resuspended in binding buffer containing annexin V–FITC and incubated for 15 min at room temperature in the dark. After adding propidium iodide, the cells were analyzed using FACSCalibur flow cytometer (BD Biosciences, Franklin Lakes, NJ). The cell population, including neutrophils and macrophages, was gated using forward and side scatter. For further characterization of inflammatory cells, immunostaining was appended after lysing RBCs. After incubation with anti-mouse CD16/CD32 (clone 2.4G2; BD Biosciences), BAL cells were stained with Gr-1–PE (BD Biosciences) and F4/80-FITC (BioLegend, San Diego, CA). Subsequently, after staining with annexin V–Pacific Blue (BioLegend) and 7-aminoactinomycin D (BD Biosciences) in a similar manner mentioned above, the cells were analyzed using a FACSCanto II flow cytometer (BD Biosciences). To examine apoptotic cells in lung, lung sections were stained with TUNEL method using the In-Situ Cell Death Detection Kit, Fluorescein (Roche, Indianapolis, IN) according to the manufacturer’s protocol. Under light microscopy, images of high-power fields were taken randomly. The numbers of TUNEL+ cells per high-power field were counted by two observers blinded to the mouse strain. Twelve high-power field images were analyzed in four lung sections from each subject (n = 6 in each group). Staining for cleaved caspase-3 staining was performed with a polyclonal Ab (Cell Signaling Technology, Danvers, MA) at a 1:50 concentration. Tyramide SuperBoost kit (Thermo Fisher Scientific) was used for fluorescent signal amplification. Under light microscopy, cleaved caspase-3+ cells were counted in a same manner as mentioned above. To examine the effect of AIM in the inflammatory resolution process, we performed phagocytosis assay using bone marrow–derived macrophages and murine macrophage cell line RAW 264.7 (American Type Culture Collection, Bethesda, MD). To obtain bone marrow–derived marcophages, bone marrow was collected from the femurs and tibiae of mice. Bone marrow cells were differentiated into macrophages by culturing the cells in DMEM/F-12 GlutaMAX (Thermo Fisher Scientific) supplemented with 10% FBS and penicillin-streptomycin (Thermo Fisher Scientific) containing 20 ng/ml M-CSF (Thermo Fisher Scientific). The RAW 264.7 cell line was cultured in DMEM (American Type Culture Collection) supplemented with 10% FBS. The macrophages were replated to 96-well culture plates (1 × 105 cells per well) and cultured for 6 h in RPMI 1640 (Sigma-Aldrich) containing 5 μg/ml recombinant murine AIM protein or BSA (Sigma-Aldrich) as control. Casein-elicited murine neutrophils were isolated by i.p. injection of 1 ml of sterile 9% casein solution 9 and 3 h before peritoneal lavage. Peritoneal lavage fluid was treated with RBC lysing buffer and rinsed with PBS(−). To facilitate neutrophil apoptosis, 1 ml of the freshly isolated neutrophil suspension was irradiated with 253.7-nm wavelength UV light (200 mJ/cm2) using a GL10 (Toshiba, Tokyo, Japan). Subsequently, irradiated cells were stained using a Vybrant CFDA SE cell tracer kit (Thermo Fisher Scientific) and were incubated in RPMI 1640 for 12 h at 37°C. Labeled apoptotic neutrophils were added (3 × 105 cells per well) to macrophages. Incubations were stopped after 2 h. Subsequently, the cells were washed with PBS(−) to remove nonphagocytosed neutrophils and quench extracellular fluorescence using 0.25 mg/ml trypan blue. The numbers of engulfed cells were determined using a Varioskan Flash (Thermo Fisher Scientific) monitoring fluorescence (excitation 493 nm, emission 515 nm). To quantify the number of phagocytosed neutrophils, calibration curves were obtained using fluorescently labeled apoptotic neutrophils. We assessed the concentrations of lipid mediators in the lung tissue as described previously (35). Briefly, whole-lung samples were collected 3 d after oropharyngeal administration of diluent or 4 mg/kg LPS and were immediately frozen in liquid nitrogen and stored at −80°C until analysis. The frozen tissues were crushed to powder and methanol was added with an internal standard (35, 36). The methanol solution was gently mixed for 1 h at 4°C and centrifuged, and the supernatant was loaded onto a preconditioned solid-phase extraction cartridge of an Oasis HLB column (Waters, Milford, MA). Then, the lipids were eluted with 200 μl of methanol. The eluent was evaporated using a vacuum evaporator and reconstituted in 50 μl of methanol; 5 μl of the methanol solution was injected for analysis (35, 36). Lipids were quantified by a LCMS-8050 triple quadrupole mass spectrometer (Shimadzu, Kyoto, Japan). Separation was performed on a Kinetex C8 column (2.6 μm, 2.1 × 150 mm; Phenomenex, Torrance, CA) with a binary mobile phase of the following compositions: 0.1% formic acid/water (mobile phase A) and acetonitrile (mobile phase B). The pump gradient [time (% A/% B)] was programmed as follows: 0 min (90/10)–5 min (75/25)–10 min (65/35)–20 min (25/75)–20.1 min (5/95)–25 min (5/95)–25.1 min (90/10)–28 min (90/10). The flow rate was 0.4 ml/min and the column temperature was 40°C. Selected reaction monitoring transitions are described previously (35). Signals were compared with those of standard curves for quantification as previously described (35, 36). All lipid standards (including 174 target compounds and 16 deuterium-labeled compounds [tetranor-PGEM-d6, TXB2-d4, PGE2-d4, PGD2-d4, LTC4-d5, LTB4-d4, 15(S)-HETE-d8, PGF2a-d4, PAF C16-d4, 6-keto-PGF1a-d4, 12-HETE-d8, OEA-d4, 5(S)-HETE-d8, eicosapentaenoic acid (EPA)-d5, docosahexaenoic acid (DHA)-d5, arachidonic acid (AA)-d8]) used as internal standards were purchased from Cayman Chemical (Ann Arbor, MI). Recombinant murine AIM protein was produced in-house as described previously (37). Briefly, Chinese hamster ovary cells were transfected with pcDNA3.10 murine AIM plasmid and cultured in CD FortiCHO medium (Thermo Fisher Scientific) for 3 d. Recombinant AIM was purified from culture supernatant using rat anti-mouse AIM mAb (clone 12, house-made) conjugated to protein G–Sepharose (GE Healthcare Life Sciences). Bound protein was eluted with 0.1 M glycine-HCl (pH 3.0) and neutralized with 1 M Tris-HCl (pH 8.5). Protein was concentrated using an Amicon Ultra filter (Millipore) and stored at −80°C in PBS(−). Endotoxin levels were measured by the chromogenic Limulus amebocyte lysate endotoxin detection system (GenScript, Piscataway, NJ). Fifty micrograms per body of recombinant murine AIM protein or BSA was administered i.p. to AIM−/− mice every other day from day −8 to day 4. Four milligrams per kilogram of LPS was administered to oropharyngeal space on day 0. The mice were sacrificed on day 5. WT mice were used as positive control. Serum AIM levels were examined with Western blotting. All data are expressed as the mean ± SEM. Differences between two groups were examined using a Student t test with a Holm adjustment for multiple comparisons. Differences between multiple groups were analyzed for significance by ANOVA followed by a post hoc Tukey honestly significant difference (HSD) test or a Dunnett test compared with control or day 0 groups where appropriate. All statistical analyses were performed using JMP Pro version 12.2.0 (SAS Institute, Cary, NC). It has been reported that AIM gene expression in the liver is enhanced after bacterial infection (24). Therefore, we first examined whether there was a change in serum AIM protein levels and AIM gene expression in lung tissue. The level of free-form AIM protein, assessed by immunoblotting under nonreducing conditions, increased on days 2–4 after LPS administration, and then rapidly decreased. In contrast, the level of total serum AIM protein, assessed by immunoblotting under denaturing conditions, increased gradually until day 7 (Fig. 1A, 1B). The levels of serum IgM, which has been reported to be closely related to serum total AIM levels (38), remained nearly unchanged (Fig. 1B). Meanwhile, the mRNA levels of AIM in lung tissue significantly increased at day 5 (Fig. 1C). Serum free-form AIM has been reported to be increased in the setting of acute kidney injury (AKI) (37); however, the levels of blood urea nitrogen and serum creatinine were not elevated after LPS administration (Supplemental Fig. 1), suggesting that there was no AKI in this study. Taken together, serum free-form AIM levels increased after oropharyngeal LPS administration without kidney dysfunction before AIM gene expression in lung tissue was enhanced. Temporal changes in serum AIM concentration and AIM gene expression in lung tissue after oropharyngeal LPS administration. (A) Immunoblot analysis of murine serum (n = 3). Serum was collected every 24 h after oropharyngeal LPS administration. Figures of immunoblotting performed under nonreducing conditions (left) and reducing conditions (right) are shown. (B) The band intensity of the immunoblot was measured. A significant increase in free AIM was seen despite a small change in total AIM and IgM levels. (C) AIM gene expression was enhanced in the resolution phase in WT mice. Control samples were from mice 5 d after vehicle (normal saline) was administered. AIM gene expression was enhanced at the time points of day 5. Data are expressed as the mean ± SEM. *p < 0.05, **p < 0.01, ***p < 0.005 by a Dunnett test. We next assessed the response of WT and AIM−/− mice to oropharyngeal LPS administration. At day 3 and 5 after LPS administration, the total cell count and neutrophil count in the BAL fluid were significantly lower in AIM−/− mice when compared with WT mice (Fig. 2A). Similarly, the macrophage count was lower in AIM−/− mice at day 5, whereas the lymphocyte count did not significantly change at any time point (Fig. 2A). The absence of AIM led to the accelerated resolution of inflammation in alveolar space. (A) The time course of BAL fluid cell differentiation was assessed at several time points after oropharyngeal administration of 4 mg/kg LPS. Control samples were from mice 5 d after vehicle (normal saline) was administered instead of LPS. The numbers of total cells, neutrophils, macrophages, and lymphocytes are shown (n = 5–17 animals per group per time point). (B) Lung sections stained with H&E (original magnification, ×100). At the time point of 5 d after oropharyngeal LPS administration, the accumulation of inflammatory cells in the alveolar space and thickening of the alveolar wall were more apparent in WT mice when compared with AIM−/− mice and the control group. Scale bars, 100 μm. (C) Time course of the lung injury score (n = 5–9 animals per group per time point). Data are expressed as the mean ± SEM. *p < 0.05 by Student t test with a Holm adjustment. To examine whether exogenous AIM rescues AIM deficiency, we administered recombinant AIM protein or BSA i.p. seven times every other day to AIM−/− mice and examined BAL fluid cell counts (Supplemental Fig. 2A). In the AIM-treated AIM−/− mice group, serum AIM levels were comparable levels with WT mice at day 5 (Supplemental Fig. 2B), and the BAL inflammatory cell counts increased to comparable levels with WT mice (Supplemental Fig. 2C). Histopathological analysis revealed the infiltration of inflammatory cells and the thickening of the interstitum, which were consistent with acute lung injury, in WT mice at day 5, whereas the extent of lung injury was attenuated in AIM−/− mice (Fig. 2B). The semiquantitative lung injury score (Table I) was significantly lower in AIM−/− mice at day 5 than in WT mice (Fig. 2C). The levels of total protein tended to be lower in AIM−/− mice when compared with WT mice at day 5 (p = 0.054, Fig. 3A) when the differences in BAL cell counts and histological changes between WT and AIM−/− mice were most evident. Similarly, the levels of TNF-α, CXCL1/KC, and CCL2/MCP-1 in the BAL fluid were significantly lower in AIM−/− mice when compared with WT mice at day 5 (Fig. 3B). The gene expressions of TNF-α, CXCL1/KC, and CCL2/MCP-1 in lung tissue were also significantly lower in AIM−/− mice than in WT mice (Fig. 3C). The levels of total protein (A) and inflammatory cytokines in the BAL fluid and their gene expressions in lung tissue decreased in AIM−/− mice in the resolution phase. (B) BAL fluid cytokines, TNF-α, CXCL1/KC, and CCL2/MCP-1, were measured using ELISA. (C) The mRNAs of TNF-α, CXCL1/KC, and CCL2/MCP-1 from whole-lung lysate were assessed by quantitative PCR (n = 5–12 animals per group per time point). Inflammatory genes tended to be lower at day 5 after oropharyngeal LPS administration. *p < 0.05, **p < 0.01, ***p < 0.005 by Tukey HSD test. Considering the apoptosis inhibitory effect of AIM (21, 23–26, 28), we evaluated apoptosis in the cells of the BAL fluid by flow cytometry (Fig. 4A–C). The number of cells in the BAL fluid was significantly and reproducibly lower in AIM−/− mice than in WT mice at day 3 and 5 after LPS administration (Fig. 4B). 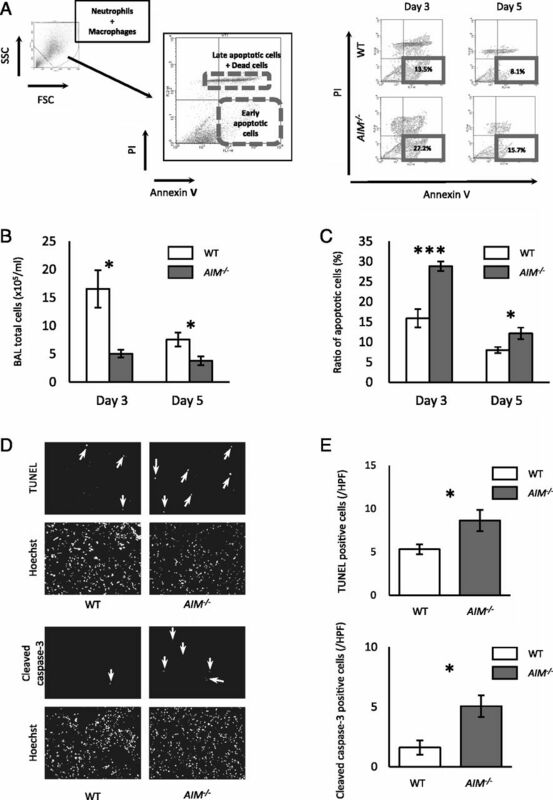 Alternatively, the ratio of apoptotic cells was significantly higher in AIM−/− mice when compared with WT mice (Fig. 4C). Additionally, we performed immunophenotyping using surface markers (Gr-1 and F4/80) and found that the ratio of apoptotic cells in AIM−/− mice were higher in both neutrophils and macrophages (Supplemental Fig. 3). Moreover, the number of apoptotic cells in the lung tissue assessed by TUNEL staining and immunostaining for cleaved caspase-3 was also significantly increased in AIM−/− mice at day 5 after LPS administration (Fig. 4D, 4E). The apoptosis of inflammatory cells in the lung was enhanced in AIM−/− mice after acute lung injury. (A) Apoptosis of inflammatory cells in the BAL fluid from WT and AIM−/− mice after LPS administration was assessed using flow cytometry. BAL cells were gated for the population corresponding to neutrophils and macrophages by forward and side scatter. The annexin V+/propidium iodide (PI)− population was identified as early apoptotic cells. (B) The numbers of total BAL cells were significantly lower in AIM−/− mice than in WT mice (n = 4–9 animals per group per time point). (C) The ratios of early apoptotic cells were significantly higher in AIM−/− mice than in WT mice (n = 4–9 animals per group per time point). (D) TUNEL staining and immunostaining for cleaved caspase-3 of lung sections from WT and AIM−/− mice at day 5 after LPS administration. Arrows indicate TUNEL+ or cleaved caspase-3+ cells, respectively. (E) Quantitative evaluation of apoptotic cells in lung sections. The numbers of TUNEL+ or cleaved caspase-3+ cells per high-power field were counted (n = 7 in each group). Data are expressed as the mean ± SEM. *p < 0.05, ***p < 0.005 by Student t test with a Holm adjustment. Because clearance of apoptotic neutrophils is essential in the process of inflammatory resolution (5, 6), we assessed the effect of AIM on the uptake of apoptotic neutrophils by macrophages. We obtained apoptotic neutrophils by UV irradiation of casein-induced peritoneal neutrophils. After incubation with AIM or BSA for 6 h, bone marrow–derived macrophages from WT and AIM−/− or murine macrophage cell line RAW 264.7 were coincubated with apoptotic neutrophils for 2 h and the number of engulfed apoptotic neutrophils was determined. The numbers of phagocytosed apoptotic neutrophils were lower when the macrophages were preincubated in the presence of recombinant AIM protein in all three macrophage populations (Fig. 5). Altogether, these data indicate that apoptosis and the subsequent removal of neutrophils were suppressed in the presence of AIM, resulting in the delayed removal of neutrophils. Recombinant AIM protein suppressed macrophage efferocytosis of apoptotic neutrophils. 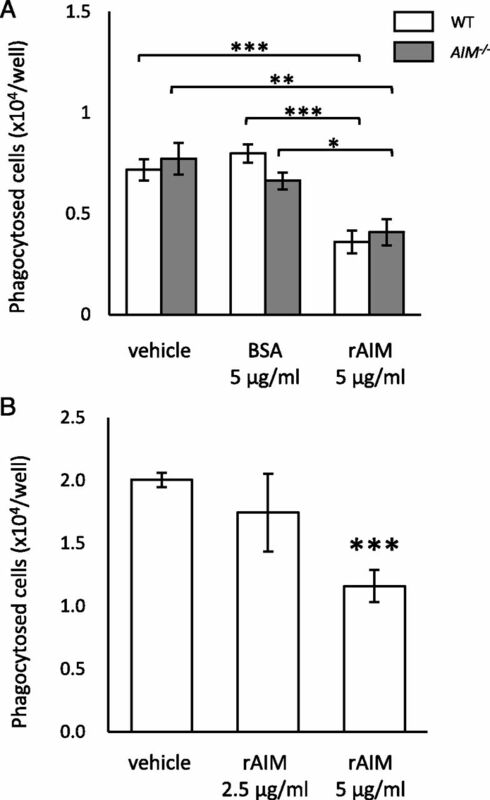 Bone marrow–derived macrophages prepared from WT or AIM−/− mice (A) or RAW 264.7 cells (B) were incubated in the presence of BSA or recombinant murine AIM protein for 6 h prior to addition of apoptotic neutrophils. Uptake of the CFDA-labeled apoptotic neutrophils (3 × 105 cells per well) was monitored 2 h after incubation by assessing the fluorescence (n = 6 in distinct cell preparations). Data are expressed as the mean ± SEM. *p < 0.05, **p < 0.01, ***p < 0.005 by Student t test with Holm’s adjustment. As several lipids have been reported to be SPMs, we hypothesized that AIM might be associated with the resolution process of inflammation by regulating proresolution lipid mediators in lung tissue. We comprehensively quantified lipid metabolites in the lung tissue of WT and AIM−/− mice with or without LPS-induced lung injury using mediator lipidomics. As a result, we determined the concentrations of 38 lipid metabolites in the lung tissue at 3 d after vehicle or LPS administration (Fig. 6, Supplemental Fig. 4). Table II shows the fold changes in the lipid metabolites in the lung tissue and p values for a Tukey HSD test between the vehicle and LPS-treated groups. 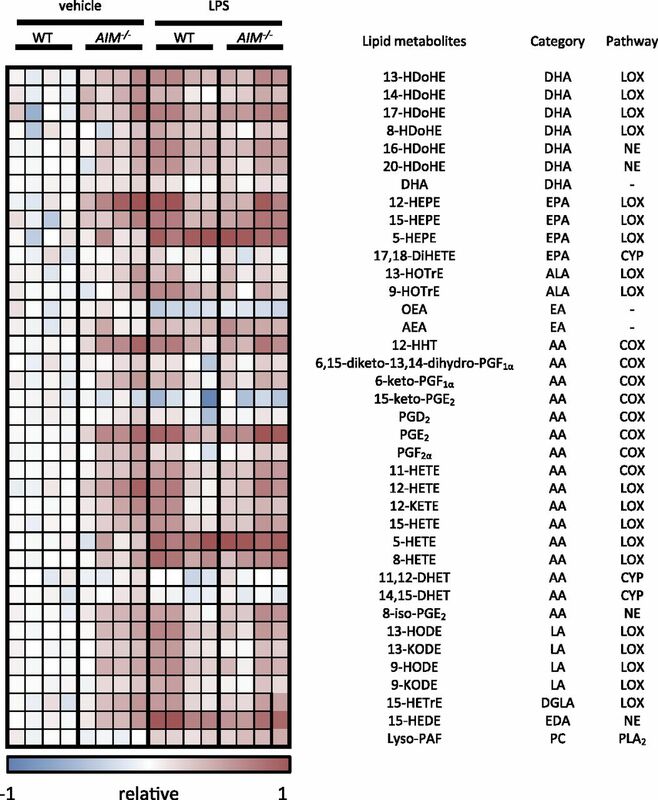 Table III shows the fold changes in the lipid metabolites in the lung tissue and p values for a Tukey HSD test between the WT and AIM−/− mice. The concentrations of linoleic acid (LA) metabolite 9-HODE and 13-HODE, eicosadienoic acid metabolite 15-HEDE, AA metabolite 8-HETE, DHA metabolite 8-HDoHE, 13-HDoHE, 16-HDoHE, 17-HDoHE, and 20-HDoHE, α-linolenic acid (ALA) metabolite 9-HOTrE, and EPA metabolite 15-HEPE increased when LPS was given in WT mice, but these metabolites were not significantly upregulated by LPS administration in AIM−/− mice, and thus, there were no remarkable differences in the lipid mediators between WT and AIM−/− mice when LPS was administered. As an overall tendency, the pattern of lipid metabolites in AIM−/− mice at baseline (when vehicle was administered) was similar to those of LPS-administered WT and AIM−/− mice (Figs. 6, 7). Lipidomic analysis of whole-lung tissue extracts showed that the lipid mediator profile of AIM−/− mice had an inflammatory/pathologic pattern at baseline. Using liquid chromatography–tandem mass spectrometry, we determined the concentrations of 38 lipid metabolites in the lung tissue at 3 d after vehicle or LPS administration (n = 4 in each group). Each value was normalized by dividing by the average of the WT-vehicle mice group and was shown in arbitrary units. Heat map shows the relative values of log10-fold changes. SPMs shared the common precursors and metabolic pathway with the lipid metabolites that were significantly altered in the presence of AIM. Lung tissue concentrations of the lipid metabolites that presented different profiles between WT and AIM−/− mice groups are shown in the metabolic pathway map (n = 4 in each group). *p < 0.05, **p < 0.01, ***p < 0.005 by a Tukey HSD test. COX, cyclooxygenase; LOX, lipoxygenase; LXA4, lipoxin A4; LXB4, lipoxin B4; MaR1, maresin1; NE, nonenzymatic; PD, protectin D1; RvE1-3, resolvin E1–3; RvD1-6, resolvin D1–6. In this study, we showed that the serum levels of free-form AIM increased in the early phase after oropharyngeal LPS administration. The serum levels of total AIM, most of which were in the AIM–IgM complex, were mostly stable, and AIM gene expression in the lung tissue of WT mice was enhanced during the course of the resolution of inflammation, although the peak in AIM expression occurred in the later phase of this process. Additionally, it was found that in the BAL fluid, the numbers of total cells and neutrophils were significantly lower in AIM−/− mice than in WT mice during the resolution phase after LPS instillation (i.e., at day 3 and 5). In parallel with this, the lung injury score also tended to be lower during the same time period, and the gene expressions of inflammatory cytokines/chemokines in the lung and their concentrations in the BAL fluid were lower in AIM−/− mice than in WT mice. Moreover, the ratio of apoptotic cells was increased in the AIM−/− mice. In the lipidomic analysis, most subsets of lipid mediators in the lung tissue extracted from WT mice increased after LPS administration, and the lipid mediator profile of AIM−/− mice at baseline showed a pattern comparable to those of WT and AIM−/− mice after LPS administration. This finding suggests that AIM may modulate the profile of lipid mediators. These data demonstrate the significant role of AIM in lipid metabolism, in which AIM may suppress the “inflammatory/pathologic” lipid mediator profile at baseline, and then activate it in the event of LPS-induced lung injury. Based on the previous reports, the AIM–IgM complex, which constitutes most of the serum total AIM, seems to be biologically inactive and they become active after released from IgM (37). Therefore, the increase in the level of free-form AIM would suggest an increase in the level of the active component of AIM in the circulation. The function of free-form AIM may be either 1) to induce aggregation of bacteria (22); or 2) to be incorporated into various types of cells to exert a regulatory effect on their intracellular physiological mechanisms, including lipid metabolism and apoptosis regulation (29). In our experiment, the serum concentrations of free-form AIM increased after oropharyngeal LPS administration. The fact that the level of free-form AIM increased before gene expression changed suggests that the increase in free-form AIM does not depend on an increase in AIM gene expression. Although we have not determined the mechanism by which the level of free-form AIM is increased, possible explanations are that 1) free-form AIM is released from the AIM–IgM complex by enzymatic decomposition or some other dissociation mechanism, and 2) free-form AIM is recruited from a storage site in some body compartment, such as the cytoplasm of macrophages or other cellular populations. Arai et al. (37) recently demonstrated that AIM dissociates from IgM in the course of AKI in both human and mice. In their report, they speculated that disturbance of the homeostasis of body fluids in AKI might reduce the affinity of AIM for IgM pentamers. In contrast, in our experiments, we did not observe an elevation of blood urea nitrogen or serum creatinine levels, as shown in Supplemental Fig. 1, suggesting that the increase in the free-form AIM level in our experiment was not the result of AKI. Because both ALI and AKI are major complications of several critical conditions, including sepsis, trauma, and hemorrhage, there might be some common mechanisms between these critical conditions that alter the binding status between AIM and IgM and that result in the release of free-form AIM. The prompt increase in the level of free-form AIM observed in both our study and the report by Arai et al. (37) may reflect the importance of a quick and secure response to life-threatening organ damage. Conversely, when an excess amount of AIM exists in the serum, IgM-free AIM rapidly binds to IgM molecule and surplus IgM-free AIM molecules (i.e., AIM that could not find a “partner” IgM) will be discharged into urine (38). Therefore, in a physiological condition, AIM level in the serum is IgM-dependent and generally stable and the significance of the AIM–IgM complex in the circulation may be in the reservoir function of AIM molecule. The mechanism for responding to inflammatory stimuli may involve an increase in the level of free-form AIM, thereby providing a hedge against flare-ups from the pathological process in the initial phase of inflammation. At the same time, the rapid decrease in free-form AIM following its transient increase may have a significant contribution to terminate the series of processes. Alternatively, the significance of increased production of AIM in the resolution phase of inflammation as shown in Fig. 1C is not clear, but one possibility is that such delayed increase of AIM production is a compensatory mechanism in case of shortage of AIM caused during the acute phase of inflammation. In the in vitro experiments using cultured macrophages, we demonstrated that macrophage efferocytosis of apoptotic neutrophils was suppressed in the presence of recombinant AIM protein, indicating that antiresolution property of AIM involves efferocytosis inhibition. Interestingly, such an effect was similarly observed in bone marrow–derived macrophages from both WT mice and AIM−/− mice, and in the RAW 264.7 cell line in which AIM gene expression was observed in RT-PCR (data not shown). Therefore, it is speculated that the effect of AIM to inhibit macrophage efferocytosis depends mainly on AIM in the extracellular milieu, not on endogenous AIM in the macrophages. So far, several factors have been reported to regulate efferocytic capacity of macrophages, including TNF-α, PGE2, reactive oxygen species, lysophosphatidic acid, and others, mainly through shifting the balance between Rho/Rac activation (39). Owing to the immense complexity in the regulation of efferocytosis, the mechanism of AIM to inhibit efferocytosis is difficult to elucidate. However, considering the effect of AIM to lipid composition, there is a possibility that alteration of lipid mediators, such as PGE2, leads to regulation of efferocytosis. In vivo study showed no significant increase of macrophages in BAL fluid from AIM−/− mice in the resolution phase of inflammation (Fig. 2A), but the results from this phagocytosis assay indicate that the efferocytic capacity of macrophages is functionally augmented in the absence of AIM. In the presence of AIM, as in the WT mice in our experiment, the levels of lipid metabolites increased in response to inflammatory stimuli. In contrast, these lipid mediators were not increased in AIM−/− mice and at similar levels to WT mice after inflammatory stimuli, suggesting that the lipid mediator profile in AIM−/− mice has the inflammatory/pathologic pattern before and after LPS administration. Such an inflammatory/pathologic lipid mediator composition includes both omega-3 polyunsaturated fatty acids (PUFAs) (metabolites of ALA, DHA, and EPA), which have anti-inflammatory and proresolution properties, and omega-6 PUFAs (metabolites of AA, LA, eicosadienoic acid, and dihomo-γ-linolenic acid), which are in most part proinflammatory. In this study, the lipid mediator profile was analyzed at day 3 after LPS administration, which was the middle point of inflammatory resolution. Therefore, the lipid mediator profile observed in the LPS-administered group might reflect the proresolving characteristics as well as ongoing inflammation. Recently, Wang et al. (40) reported the role of AIM as a regulator of lipid metabolism in Th17 cells. In their data, AIM was highly expressed in what they called “non-pathogenic” Th17 cells, and the expression of AIM was positively associated with proinflammatory signature genes, which suggested that AIM is a negative regulator of the pathogenicity of Th17 cells. They also showed that AIM shifted the fatty acid composition of the Th17 cell lipidome and regulated the pathogenicity of Th17 cells, and that a component of the intracellular lipids of nonpathogenic Th17 cells in the presence of AIM revealed increased amount of several lipid metabolites, more than half of which were PUFAs. Our results were similar to those of Wang et al. in that 1) in the presence of AIM, the lipid mediator profile presented a noninflammatory/pathologic pattern at baseline, and 2) in the inflammatory/pathologic condition, the lipid mediator profile presented a similar pattern irrespective of the presence of AIM that was similar to the pattern seen for AIM−/− mice at baseline. Despite differences in the experimental systems, it seems that AIM regulates the profile of lipid metabolites in response to the inflammatory/pathologic status. Assuming that AIM acts on lipid mediators as a negative regulator of inflammatory/pathologic status, the results of the cell type– and cell phenotype–specific analysis by Wang et al. and our analysis for gross trends in whole-lung tissue extracts are consistent in that AIM exerts lipid mediator control in response to the pathologic status. Our data of a gross trend of the lipid metabolites, combined with data by Wang et al. (40), strongly suggest that the whole lipidomic profile was under the influence of AIM. 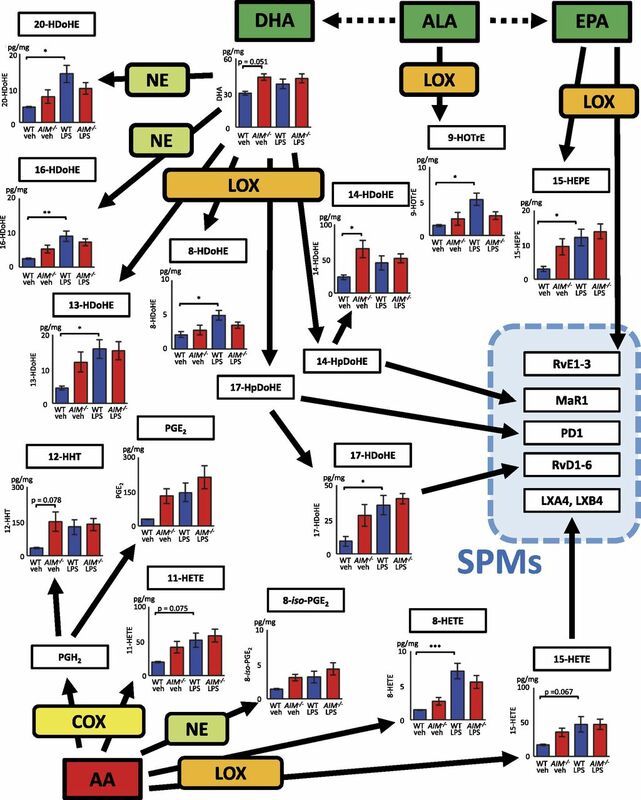 Of note, several lipid metabolites mentioned above share common precursors and metabolic pathways with the SPMs (Fig. 7). It is regrettable that the levels of such SPMs could not be directly determined in our analysis. However, in our analysis, there are some metabolites that are the precursors or byproducts of such SPMs. For instance, 14-HDoHE is known as a marker of activation of the maresin pathway (41). 17-HDoHE is a marker for D series resolvins (resolvin D1–6) and protectin D1 (41). 15-HETE is a marker for lipoxin A4 and B4 (41). In the meantime, 17-HDoHE itself has been reported to be converted to D-series resolvin and have an anti-inflammatory property (42). These metabolites followed the same trend mentioned above (Fig. 7). Alternatively, some lipid mediators are known to be metabolized in the local tissue where they are formed, leading to production of further metabolites. Some of such metabolites possess activity comparable to their precursors (e.g., protectin D1 is converted to 22-hydoxy-protectin D1), and others are inactivated (e.g., resolvin D1 is converted to 17-oxo-resolvin D1). Their levels are not assessed in our analysis, and we note that the obtained data are a limited part of the whole picture. The mechanism by which AIM altered the lipid mediator profile remains unclear. Given that the concentrations of many metabolites sharing common precursors followed similar trends regardless of the metabolizing pathway, it is assumed that AIM may influence upstream of the lipid pathway, but not lipid-metabolizing enzymes, such as cyclooxygenase or lipoxygenase. It has been reported that AIM functions in suppressing the enzymatic activity of fatty acid synthase by directly binding to its several functional domains (29). Therefore, our data might reflect the effect of AIM in regulating the upstream component of lipid metabolism. AIM has previously been reported to have an antiapoptotic effect (21, 23–26, 28), but the mechanism behind this apoptosis inhibitory effect has not been fully investigated, although a recent report has suggested that the interaction of AIM with insulin-like growth factor–binding protein-4 is involved (43). Although the cause-and-effect relationship between the alteration of the lipid mediator profile and the apoptosis of inflammatory cells in the lung was not demonstrated in the present study, some lipid mediators including SPMs (44, 45), DHA (46), and PGE2 (47) have been reported to promote apoptotic cell death depending on the cell type and physiological circumstances. Therefore, the inflammatory/pathogenic lipid mediator profile, as seen in AIM−/− mice and LPS-treated mice, might accelerate apoptosis. Such knowledge on the regulatory function of lipid mediators in apoptotic cell death may enable elucidation of the mechanism behind the apoptosis inhibitory function of AIM. This study has several limitations. First, LPS is a bacterial wall component, but not a viable bacteria itself. Therefore, it remains to be seen whether similar results would be obtained with actual bacterial infection in AIM−/− mice. Considering that neutrophils are involved in the first defense against pathogen infection and that the mechanism of inflammation itself has a protective role against noxious stimuli, the property of AIM in establishing a lipid mediator profile against inflammatory stimuli might be beneficial for the host survival. Additionally, in bacterial pneumonia, it is possible that the extent of inflammation is restricted due to the protective role of AIM in bacterial infection through recognition property against bacterial surface molecules as reported by Sarrias et al. (22). Second, the LPS model that we employed is a model of transient and self-limited inflammation, so most of the animals in our experiment survived and recovered, and we have not observed any survival benefits of AIM-deficient condition. Additionally, LPS tolerance is easily induced with repeated administrations of LPS in the murine model; therefore, it is difficult to elucidate the effect of AIM in chronic inflammation using the LPS model. Third, although the intrapulmonary gene expression of AIM was shown to increase in the whole-lung lysate, we have not assessed the expression of AIM in tissues from other organs, such as liver or spleen, where a large portion of AIM in the circulation is considered to be produced (20). Fourth, in the lipid mediator analysis, we observed only the time point of day 3, and it is unknown whether these profiles would differ at other time points. As such, we might have observed only a transition phase from the inflammatory/pathologic phase to the resolution phase. Lastly, in the process of resolution of inflammation, several factors other than lipid, such as NO, adenosine, anti-inflammatory microRNAs, endogenous corticosteroids, inhibitors of pattern-recognition receptors, anti-inflammatory cytokines such as IL-10, and regulatory T cells, have been shown to be involved (45). They were not targeted in our analysis and further investigation is warranted. 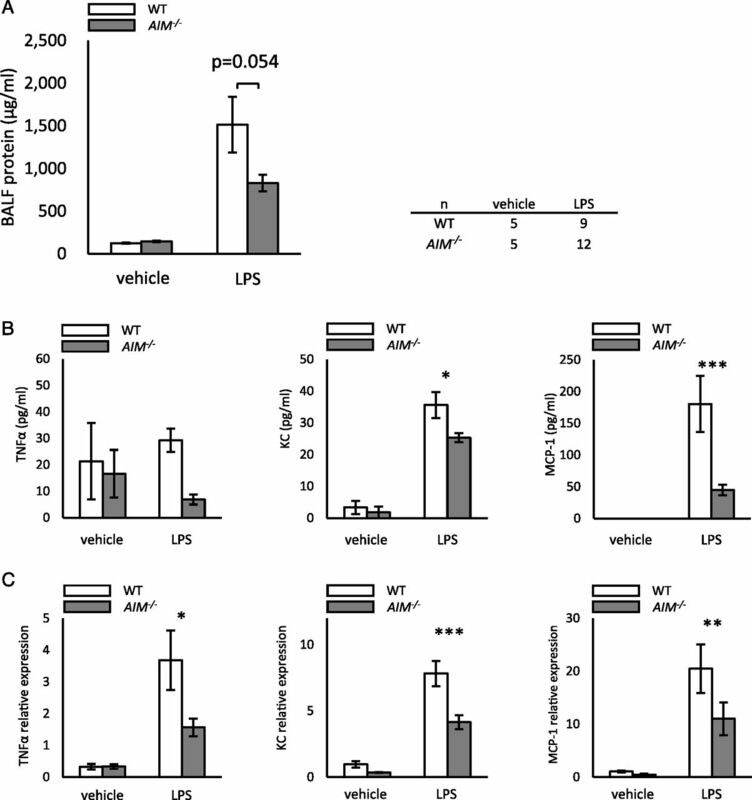 In conclusion, we have demonstrated that the level of free-form AIM rapidly increased during the first couple of days in the setting of LPS-induced lung injury, and that the resolution of lung injury was accelerated in AIM−/− mice along with enhanced apoptotic cell death in airway inflammatory cells. An in vitro experiment showed that macrophage efferocytosis of apoptotic neutrophils was attenuated in the presence of AIM. In the lipidomic analysis, the lipid mediator profile of AIM−/− mice was maintained in an inflammatory/pathologic pattern with both proinflammatory and proresolution features; this was in contrast to the lipid mediator profile of WT mice at baseline, suggesting that the lipid mediator composition is set to the noninflammatory/pathologic status at baseline in the presence of AIM. These data indicate that AIM is involved in the regulation of lipid mediators and, consequently, that AIM functions as a molecular switch between the noninflammatory/pathologic status and inflammatory/pathologic status; this is important because an inflammatory reaction is a “two-edged blade,” and maintaining balance is a critical matter to exert effective host defense while minimizing the undesirable side effects of acute inflammation. We thank Dr. Koichi Fukunaga (Keio University), Dr. Hiroaki Sunaga (Gunma University), Dr. Akira Nishiyama (Kagawa University), Dr. Yasuhito Ito (Nagoya University), Dr. Masaaki Murakami (Hokkaido University), Dr. Daisuke Kamimura (Hokkaido University), Dr. Takehiko Yokomizo (Juntendo University), Dr. Toshiaki Okuno (Juntendo University), and Mai Ohba (Juntendo University) for advice and discussions. We thank Yoko Tani for excellent technical assistance. This work was supported by the Agency for Medical Research and Development–Core Research for Evolutional Medical Science and Technology, Japan Agency for Medical Research and Development.
. 2000. The acute respiratory distress syndrome. N. Engl. J. Med. 342: 1334–1349.
. 2005. Incidence and outcomes of acute lung injury. N. Engl. J. Med. 353: 1685–1693.
. 1994. Report of the American-European consensus conference on ARDS: definitions, mechanisms, relevant outcomes and clinical trial coordination. Intensive Care Med. 20: 225–232. 1991. Intact epithelial barrier function is critical for resolution of alveolar edema in humans. Am. Rev. Respir. Dis. 144: 468.
. 1997. Neutrophil apoptosis in the acute respiratory distress syndrome. Am. J. Respir. Crit. Care Med. 156: 1969–1977. 1994. Apoptosis in disease. Eur. J. Clin. Invest. 24: 715–723.
. 2004. Inflammatory resolution: new opportunities for drug discovery. Nat. Rev. Drug Discov. 3: 401–416.
. 2014. Resolvins, specialized proresolving lipid mediators, and their potential roles in metabolic diseases. Cell Metab. 19: 21–36.
. 1998. Neutrophil-mediated changes in vascular permeability are inhibited by topical application of aspirin-triggered 15-epi-lipoxin A4 and novel lipoxin B4 stable analogues. J. Clin. Invest. 101: 819–826.
. 2012. Macrophage proresolving mediator maresin 1 stimulates tissue regeneration and controls pain. FASEB J. 26: 1755–1765.
. 2014. Maresin 1 biosynthesis during platelet-neutrophil interactions is organ-protective. Proc. Natl. Acad. Sci. USA 111: 16526–16531. 2014. Pro-resolving lipid mediators are leads for resolution physiology. Nature 510: 92–101.
. 2012. Resolvin D1 limits polymorphonuclear leukocyte recruitment to inflammatory loci: receptor-dependent actions. Arterioscler. Thromb. Vasc. Biol. 32: 1970–1978.
. 1996. In vivo fate of the inflammatory macrophage during the resolution of inflammation: inflammatory macrophages do not die locally, but emigrate to the draining lymph nodes. J. Immunol. 157: 2577–2585.
. 2002. Adhesion molecule-dependent mechanisms regulate the rate of macrophage clearance during the resolution of peritoneal inflammation. J. Exp. Med. 196: 1515–1521.
. 1997. Molecular cloning, mapping to human chromosome 1 q21-q23, and cell binding characteristics of Spα, a new member of the scavenger receptor cysteine-rich (SRCR) family of proteins. J. Biol. Chem. 272: 6151–6158.
. 1999. Increased susceptibility of thymocytes to apoptosis in mice lacking AIM, a novel murine macrophage-derived soluble factor belonging to the scavenger receptor cysteine-rich domain superfamily. J. Exp. Med. 189: 413–422.
. 2005. A role for human Spα as a pattern recognition receptor. J. Biol. Chem. 280: 35391–35398.
. 2001. Association of AIM, a novel apoptosis inhibitory factor, with hepatitis via supporting macrophage survival and enhancing phagocytotic function of macrophages. J. Biol. Chem. 276: 22910–22914.
. 2003. AIM inhibits apoptosis of T cells and NKT cells in Corynebacterium-induced granuloma formation in mice. Am. J. Pathol. 162: 837–847.
. 2011. Listeria monocytogenes infection induces prosurvival metabolic signaling in macrophages. Infect. Immun. 79: 1526–1535.
. 2005. A role for the apoptosis inhibitory factor AIM/Spα/Api6 in atherosclerosis development. Cell Metab. 1: 201–213.
. 2007. Apoptosis inhibitor expressed by macrophages tempers autoimmune colitis and the risk of colitis-based carcinogenesis in TCRα−/− mice. J. Clin. Immunol. 27: 549–556.
. 2013. Apoptosis inhibitor of macrophage (AIM) expression in alveolar macrophages in COPD. Respir. Res. 14: 30.
. 2010. Macrophage-derived AIM is endocytosed into adipocytes and decreases lipid droplets via inhibition of fatty acid synthase activity. Cell Metab. 11: 479–492.
. 2013. The scavenger protein apoptosis inhibitor of macrophages (AIM) potentiates the antimicrobial response against Mycobacterium tuberculosis by enhancing autophagy. PLoS One 8: e79670.
. 2015. The human CD5L/AIM-CD36 axis: a novel autophagy inducer in macrophages that modulates inflammatory responses. Autophagy 11: 487–502.
. 2015. Size-exclusion chromatography as a stand-alone methodology identifies novel markers in mass spectrometry analyses of plasma-derived vesicles from healthy individuals. J. Extracell. Vesicles 4: 27378.
. 2009. Curcumin attenuates elastase- and cigarette smoke-induced pulmonary emphysema in mice. Am. J. Physiol. Lung Cell. Mol. Physiol. 296: L614–L623.
. 2012. Resolution of experimental lung injury by monocyte-derived inducible nitric oxide synthase. J. Immunol. 189: 2234–2245.
. A comprehensive quantification method for eicosanoids and related compounds by using liquid chromatography/mass spectrometry with high speed continuous ionization polarity switching. 2015. J. Chromatogr. B. Analyt. Technol. Biomed. Life Sci. 995–996: 74–84.
. 2016. Apoptosis inhibitor of macrophage protein enhances intraluminal debris clearance and ameliorates acute kidney injury in mice. Nat. Med. 22: 183–193.
. 2013. Obesity-associated autoantibody production requires AIM to retain the immunoglobulin M immune complex on follicular dendritic cells. Cell Reports 3: 1187–1198.
. 2011. Modulation of macrophage efferocytosis in inflammation. Front. Immunol. 2: 57.
. 2015. CD5L/AIM regulates lipid biosynthesis and restrains Th17 cell pathogenicity. Cell 163: 1413–1427.
. 2011. The precursor of resolvin D series and aspirin-triggered resolvin D1 display anti-hyperalgesic properties in adjuvant-induced arthritis in rats. Br. J. Pharmacol. 164: 278–293.
. 2015. Interaction of AIM with insulin-like growth factor-binding protein-4. Int. J. Mol. Med. 36: 833–838.
. 2013. Docosahexaenoic acid (DHA) induces apoptosis in human hepatocellular carcinoma cells. Int. J. Clin. Exp. Pathol. 6: 281–289.
. 2014. Bioactive lipids and the control of Bax pro-apoptotic activity. Cell Death Dis. 5: e1266.